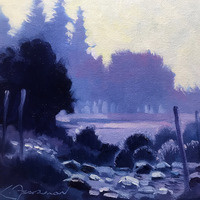 An oil painting demo by Lynne Fearman will be held on at the meeting of the Santa Clarita Artists Association (SCAA). This event is free, open to the public and meets at 6:30 pm at Barnes & Noble, 23630 Valencia Blvd. Over the years she has garnered numerous awards for her work and has shown her work in the Riverside Art Museum and Pasadena Museum of History. She was commissioned to create “Bearlovian Paradise” as a permanent art installation for the Monrovia Library in 2010. Come early, standing room only by 6:30. See www.SantaClaritaArtists.org.